Please note – This article relates to basic Maths teacher resumes, not specialist, or Special Education areas. Essential statutory information – This information includes state licenses, required certifications, and may include systems certifications, and/or background checks. Make sure that your resume contains all the required information before submission. Qualifications and practical experience – Schools need teachers who can deliver practical teaching results, as well as expertise in maths. Your resume must show both. The functional resume format is an excellent type of resume formatting, giving a lot of flexibility and space management options. This is the best format resume to highlight your skills and abilities. Title and contacts – Name, phone number, email, and address. Personal profile/ objectives – This is an introductory overview of your work, career, and expertise, sometimes called a summary, one paragraph. Skills – The skills section is a critical part of your resume. You can use this section to list your skills and extrapolate advanced skills. Be sure to match your skills with job requirements. Qualifications – List qualifications, using the academic format denoting degree, honors, institution, and date of qualification. You can also use this section for your statutory documentation, or have a special section for that information. Employment history – This is a particularly important section on your resume, detailing past experience and showing you have the required levels of experience for the job. Make sure to show your experience in direct context with job requirements. One of the major issues for experienced teachers is the sheer amount of information they can put on their resumes. More isn’t necessarily better. Edit your math or art teacher resume to make sure you include clearly relevant information. Skills – This section allows you to deliver useful information showing your expertise. Employers need to see superior skills and clear value to the teaching role. Experience – Experience is extremely important and highly relevant to candidate selection. Schools need to see that you can deliver the work they need, self-manage and achieve goals. Spell out your practical experience, showing obvious relevance to the requirements of any position for which you apply. At high school level, anticipated job growth for Mathematics teachers in the US to 2022 is 6%, or 52,900. Average salary is $55, 050. The number of jobs is proportionate to the current number of teaching positions at high school level. 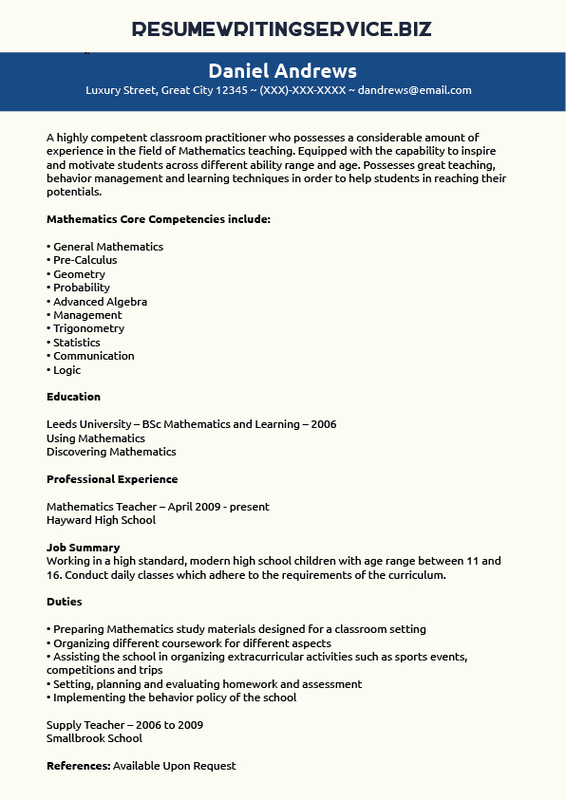 For a math teacher resume, feel free to contact us now!